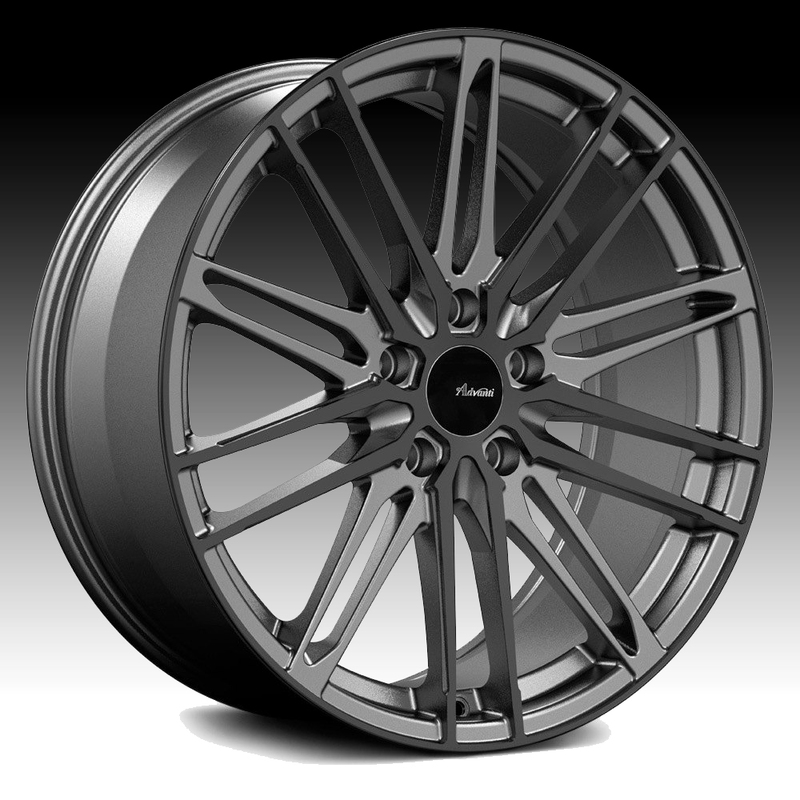 The Advanti Racing Diviso gunmetal black wheel is available in 18x8 and 19x8.5 sizes. The Advanti Diviso is available for most passenger cars and crossover vehicles. Free shipping on all Advanti wheels. Free lug kit with the purchase of 4 Advanti Diviso gunmetal wheels. 18x8 5x100 +35 DS8851035G $186.00 26.96 Lbs -->> Call or email for special deals! 18x8 5x100 +45 DS8851045G $186.00 26.07 Lbs -->> Call or email for special deals! 18x8 5x108 +45 DS8850845G $186.00 26.07 Lbs -->> Call or email for special deals! 18x8 5x112 +35 DS8851235G $186.00 26.96 Lbs -->> Call or email for special deals! 18x8 5x112 +45 DS8851245G $186.00 26.07 Lbs -->> Call or email for special deals! 18x8 5x114.3 +35 DS8851435G $186.00 26.96 Lbs -->> Call or email for special deals! 18x8 5x114.3 +45 DS8851445G $186.00 26.07 Lbs -->> Call or email for special deals! 18x8 5x120 +35 DS8852035G $186.00 26.96 Lbs -->> Call or email for special deals! 19x8.5 5x100 +45 DS9A51045G $222.00 27.88 Lbs -->> Call or email for special deals! 19x8.5 5x108 +45 DS9A50845G $222.00 27.88 Lbs -->> Call or email for special deals! 19x8.5 5x112 +35 DS9A51235G $222.00 28.76 Lbs -->> Call or email for special deals! 19x8.5 5x112 +45 DS9A51245G $222.00 27.88 Lbs -->> Call or email for special deals! 19x8.5 5x114.3 +35 DS9A51435G $222.00 28.76 Lbs -->> Call or email for special deals! 19x8.5 5x114.3 +45 DS9A51445G $222.00 27.88 Lbs -->> Call or email for special deals! 19x8.5 5x120 +35 DS9A52035G $222.00 28.76 Lbs -->> Call or email for special deals!